The classic Egyptian ‘Book Of’ theme gets a sprinkling of Megaways™ with a heavy dash of free spins and a 50,000x top payout. A glistening gold slot with massive variance and 15,625 ways to win. The Blueprint Megaways™ story continues. Play Legacy of Ra from 10p to £100 per spins. 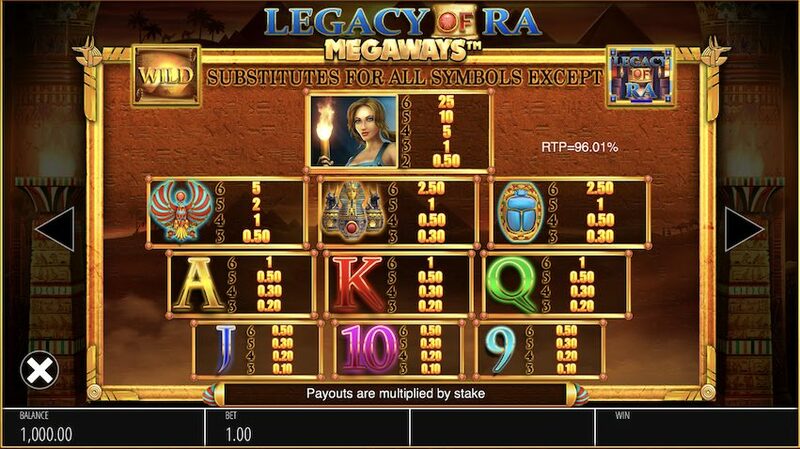 Where Can I Play Legacy of Ra Megaways™ Slot? The classic Egyptian-themed Book of series of slots has included some of the most exciting games of all time, with evergreen titles like Book of Dead and Book of Ra famous for their blistering win sequences. So it stands to reason that a game that combines the high points of Novomatic’s expanding symbols with Big Time Gaming’s epic Megaways™ mechanic would be one you’d be just itching to have a spin on, right? Well get ready, because here it is. And it’s a gleaming colossus of a slot with a massive 50,000x top payout across 6 reels with 15,625 ways to win. This is a smart-looking slot, combining the usual array of pyramids, shining gold, hieroglyphs, scarabs and adventurers in the imagery. The 6 reels and variable rows are flanked by two pillars topped with fire. The low value symbols are the cards 9 through to Ace, whilst the high value symbols are the ancient symbols and the female explorer (worth 25x for 6 on a line). Look out as well for the Wild which is the scroll featuring a pyramid. The reels can expand to just five rows deep, with winlines created by identical symbols on adjacent rows from left to right only. Here you can re-trigger the free spins in the same way an UNLIMITED number of times. Before the round begins a random symbol is chosen. When it lands multiple times on one spin then it will expand to take up an entire reel. This is where the biggest win sequences will come from. Finally, note that you can BUY IN to the bonus round and start with 10 free spins if you pay 100x your stake. Blueprint continue to build on the success of their Megaways™ catalogue to date with this simple but brilliant combination of one of the most successful slots themes of all time and BTGs high variance game engine. It’s not the most thrilling to play – you’ll be spending a lot of time waiting to crack the bonus round, but when you do, there are big wins in waiting.